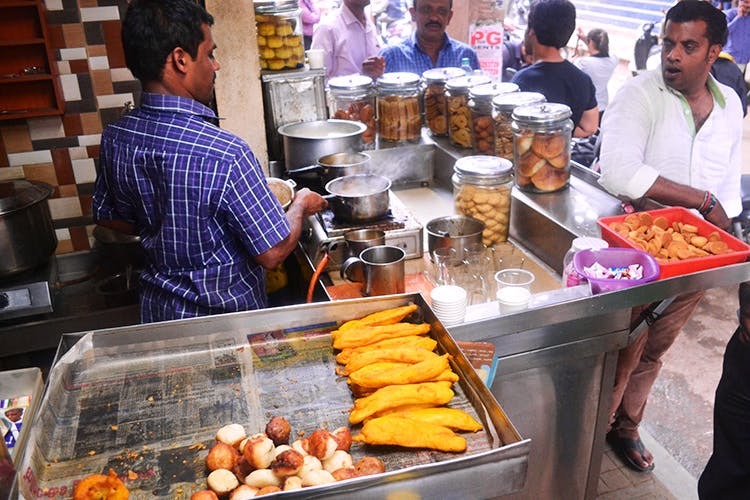 Rahiman’s Tea Stall is a quick fix with their crunchy samosas, sweet pakodas and perfect chai. Opened in 1989, Rahiman’s Tea Stall, located just off the Thippasandra Main Road, is the preferred destination for the tired office worker taking a break from the strenuous work schedule. And that included me, although I’m not quite the tired sort. But hey, you can’t say no to strong chai and crispy snacks to go along with it. Plus, since they have no seating, you can stand outside and take that much needed break, and stretch your self. They also have masala vada and sweet vadas, made of green gram daal, along with loads of biscuits and sweets. With everything priced around INR 10, don’t feel too stingy — stock up well before heading back to work. And remember my warning. Head there for your evening chai or come in the afternoon – the crowd is no less. But crowded or not, this tea stall iis lovely to just hang around, and enjoy the Bangalore weather with a glass of hot tea.